Edited by Sashi S Kommu . The coupling of several areas of the medical field with recent advances in robotic systems has seen a paradigm shift in our approach to selected sectors of medical care, especially over the last decade. Rehabilitation medicine is one such area. The development of advanced robotic systems has ushered with it an exponential number of trials and experiments aimed at optimising restoration of quality of life to those who are physically debilitated. Despite these developments, there remains a paucity in the presentation of these advances in the form of a comprehensive tool. This book was written to present the most recent advances in rehabilitation robotics known to date from the perspective of some of the leading experts in the field and presents an interesting array of developments put into 33 comprehensive chapters. The chapters are presented in a way that the reader will get a seamless impression of the current concepts of optimal modes of both experimental and applicable roles of robotic devices. Robotic instrument designs are combined with the results of experiments and trials in an applicable and practical way. The ethos of the book is unique in that there is a considerable emphasis on practical applicability in making real time changes to patient care. The book begins by exploring the inherent and unique challenges of paediatric rehabilitation and presents the robotic platforms upon which promising preliminary results were noted. It then explores the key elements of robotic safety critical systems and risk management issues, an area of great concern in the medical field at present. There is also an in depth look at the role of robotics from a mechanotronics and virtual reality standpoint. The concept of high safety rehabilitation systems using functional fluid is explored and the platform for further studies is introduced. The concept of powered wearable assistance and the role of exoskeleton devices pave the brink of an exciting era in rehabilitation robotics. Additional concepts explored involve the interaction-control between robot, patient and therapist. ‘Rehabilitation Robotics’ promises to be a valuable supplementary tool to all those involved in rehabilitation from the standpoint of the patient and affected families, the therapist and the robot. It also acts as a platform upon which researchers can gain a solid and evidence based approach towards the initiation of future projects. Loredana Zollo, Domenico Formica and Eugenio Guglielmelli . You've just read an article category Engineering Technology in Medicine by title TEXTBOOK : Rehabilitation Robotics. 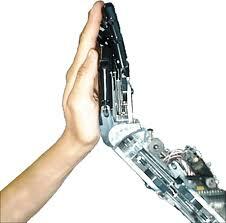 You can bookmark this page URL http://www.openaccessbooks.com/2013/03/textbook-rehabilitation-robotics.html. Thank you! No comments yet "TEXTBOOK : Rehabilitation Robotics"